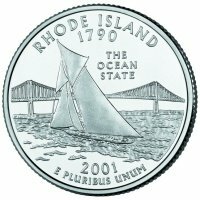 The Rhode Island State Quarter was the third state quarter issued in 2001 and the 13th in the series which was authorized by the 50 States Commemorative Coin Program Act. 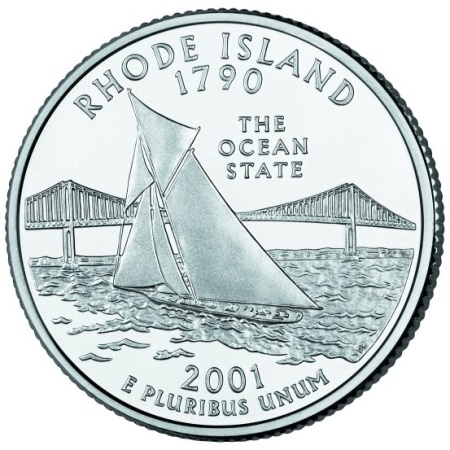 The release date for the RI State Quarter was May 21, 2001 and the theme chosen for the design was The Ocean State. The elements of the design showcase sailing, Rhode Island's most popular sport. The highlight of the design is a vintage sailboat sailing on Narragansett Bay with an image of the Pell Bridge in the background. Although Rhode Island is the smallest of the United States, it has over 100 beaches on over 400 miles of coastline, earning it the title of the "sailing capital" of the world. The Rhode Island State Council on the Arts was authorized by order of Governor Lincoln Almond to organize a Coin Concept Advisory Panel in order to choose the state's design concept. The Panel chose three concepts from more than 500 entrants and citizens of Rhode Island then voted on their favorite design. 57% of the 34,566 votes received were for the sailboat design. Below is a table showing the design specifications and mintages of the Rhode Island State Quarter. Note: The modification moved some of the wording from the reverse to the obverse to leave the reverse available for the state's design. Reverse - Each state theme was proposed, and approved, by the governor of the state. Final design was created by Daniel Carr and engraved by Thomas D. Rodgers. His initials are on the right side near the bottom of the 'ocean'.